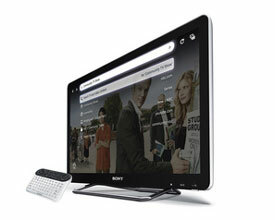 Sony kicks the living room app race up a notch as the first TV/Blu-ray manufacturer to include Google TV in its products. 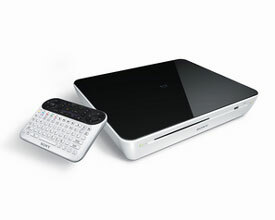 Google TV, which launched last week on the Logitech Revue set top box, delivers full Internet browsing (including Flash), a limited number of Android apps (the Market is coming in 2011) and a TV-optimized search across your pay TV service and the Internet. Sony’s products also come loaded with Sony's premium streaming service, Video On Demand powered by Qriocity, which will compete against Amazon's Video OnDemand and iTunes. 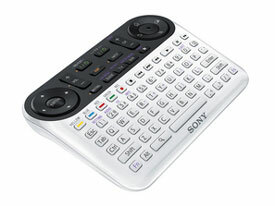 All Sony Internet TV products have built-in Wi-Fi and an RF remote with full QWERTY keyboard, a trackball-like mouse and a full array of audio-video related buttons. In the hand, the remote feels incredibly light and is obviously meant for thumb typing. Trigger-style buttons on the back let you zoom in on and scroll through web pages, and the two pads, a rocker pad and the mouse, provide full access to web pages. In my limited testing, the mouse was jumpy and the “Dual View” button, which is supposed to let you toggle between live TV and the Google TV content, didn’t work reliably. Let’s hope that was due to the device’s pre-production status and a room packed with all sorts of wireless devices. Sony also will be making an app available later this fall for Android phones and select other mobile devices that will let you use it as remote. The Sony Internet TV line includes the 24-inch NSX-24GT1 ($600), the 32-inch NSX-32GT1 ($800), the 40-inch NSX-40GT1 ($1,000), the 46-inch NSX-46GT1 ($1,400) and the NSZ-GT1 ($400) Blu-ray player. Products are currently on pre-sale at SonyStyle.com and BestBuy.com and will be available for purchase at Sony Style stores on October 16, 2010 and at Best Buy starting the week of October 24, 2010.